Clear, well-marked Address Plaques for Home make beautiful additions to accent any house, entrance or yard. Home address plaques offer more than just curb appeal, they also add character to your home. Address plaques for home also help make your residence a safer place by making it easier for emergency personnel to find your address. Service providers and delivery people also appreciate well-positioned and visible address plaques. MailboxWorks carries a wide selection of decorative home address plaques in numerous styles, colors, shapes, and finishes so it’s easy to find one to suit your home’s décor and your personal preferences. We also customize decorative address plaques for home to better suit your tastes and needs. Whether you need a hanging address plaque or a lawn address sign, you’ll find it at MailboxWorks. 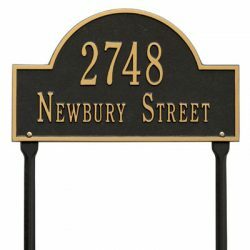 We carry Whitehall address plaques for home plus illuminated address signs, vertical address plaques, hanging address plaques for your yard or lawn, plus ceramic and stone address plaques. The possibilities are virtually endless so let us personalize a decorative address plaque just for you! Lawn markers have always been very popular choices for address plaques. While lawn address plaques are quite commonly used for commercial properties and high-density housing complexes, more and more residential homeowners are choosing lawn address plaques for home accenting. Two-sided lawn address plaques can be personalized and may be mounted or hung, depending on your preference. All our address plaques are made highly durable and are protected with weather resistant finishes. Similar to our lawn markers, you can purchase two-sided hanging address plaques in numerous color and finish combinations. They are also available for post mount situations or may be mounted on any flat surface. MailboxWorks also carries a number of decorative hanging address plaques for home with unique hanging brackets such as our Harley Davidson hanging address plaque. Depending on your situation, finding the best place to hang your home address plaque may necessitate purchasing a vertical address plaque. You can have vertical address plaques customized as well and we carry a number of unique designs including illuminated vertical address plaques like the one pictured here. Vertical address plaques are perfect for installation on mailbox posts, pillars, columns or strategically affixed to your home. Another classy option that adds instant curb appeal to your home is a lighted address plaque, which we can also customize. Address numbers are illuminated from behind making them highly visible from the street. Illuminated address plaques and Reflective Address Plaques are great for helping people locate your house after dark (including emergency personnel). Illuminated address plaques for homes may be simple and elegant, or they may have carved embellishments like oak leaves or fleur de lis motifs. Many of them are wired directly into a standard doorbell transformer, but some come with the option of hard wiring or a transformer for a standard plug. Address plaques are great for instantly upgrading your house’s curb appeal, and they also make fantastic housewarming gifts. Many of today’s address plaques are made with powder-coated finishes that look great and can stand up to the elements. The MailboxWorks carries a selection of unique specialty address plaques for home including Ceramic Address Plaques, Small Entryway Address Plaques and Stone and Garden Address Plaques. We sell a lot of house address plaques to individual homeowners, but along with address plaques for home, we also carry House Numbers and Letters for residential, business, and commercial use. 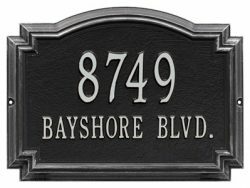 You can purchase custom address plaques online or for more information about our selection of address plaques for home, call us toll-free at 1-866-717-4943 or Contact MailboxWorks online.